157. Grindstones.—A few years ago the grindstone was a common piece of equipment on the farm, but, with the great improvement made in artificial abrasives and grinders, it now has been largely replaced by the new and faster-cutting grinders. Although a grindstone cuts much slower (unless it is power driven and considerable pressure is used), it puts a very fine cutting edge on a tool without danger of drawing the temper and is preferred by many for the sharpening of edge tools, mower sickles, ensilage-cutter knives, etc. 158. Grinders for the Farm Shop.—Every farm shop should have a grinder of some kind for sharpening tools and for the many odd grinding jobs that arise, such as grinding metal part« to fit, grinding hard materials that cannot well be filed or otherwise shaped, etc. 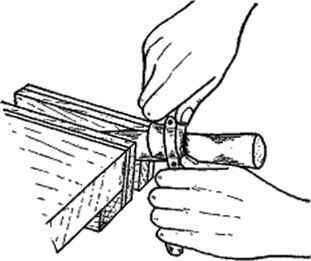 A hand-operated grinder that clamps to the work bench is recommended if a larger power-driven grinder cannot be afforded. If electricity is available, a bench grinder carrying two wheels and driven with a V-belt from a 34-hp. motor is a very practical unit. Interchangeable wheels may be used, and one of them may well be a special double-cone wheel for grinding mower sickles. Where electricity is not available, it is sometimes possible to use a small gas engine for power. For general grinding, a good belt-driven grinder is usually preferred to a motor grinder with wheels mounted on the ends of the motor shaft, because the wheels are more accessible on a belt-driven outfit. In selecting a grinder of any kind, it is important to get one that is sturdy and well-built, with good bearings that can be adequately lubricated and that are well protected from grit and dirt. Good, sturdy, adjustable work rests are also important. 159. Good Grinding Wheels Are Important—The secret of success with a grinder is to select good wheels that are suited to the kind of grinding to be done. In order to be able to select wheels and to use them most effectively, one should understand how they are made and how they grind. 160. Electric-furnace Abrasives.—The abrasive particles from which modern grinding wheels are made are products of the electric furnace. Certain materials are mixed and chemically combined into large crystalline masses under the intense heat of the furnace. After cooling, these large pieces are broken and crushed to small particles. These small ill particles, which are very hard and have sharp corners, are then cemented together to form various kinds and shapes of grinding wheels and sharpening stones. Two principal kinds of abrasives are made in the electric furnace: (1) aluminum oxide, which is used for grinding materials of high tensile strength like steel, and (2) silicon carbide, which is used mainly for grinding materials of low tensile strength like cast iron. 161. Action of a Grinding Wheel.—-The hard sharp particles on the surface of a grinding wheel cut or scratch the material being ground. After a certain amount of grinding, these particles become dull and are pulled from the wheel under the grinding pressure. A good grinding wheel that is suited to the work being done gradually but slowly wears away, "shedding" the particles as they become dull and keeping sharp particles constantly exposed. If the particles do not shed fast enough, the surface of the wheel becomes glazed and rubs instead of cutting, thereby causing excessive heat, which would draw the temper of tools. If the particles shed too fast, the wheel does not hold its shape well, and it soon wears out. The rate of shedding is determined by the kind, strength, and amount of cement or bonding material used in making the wheels. Wheels that shed easily are known as soft, and wheels that shed slowly are known as hard. A soft wheel, although it wears away somewhat faster, has less tendency to heat the work and is therefore preferred for grinding tools. 162. Grain.—The coarseness or fineness of grinding wheels is designated by a number representing the size of grains or particles used in making the wheel. A grain of 36, for example, means that the finest screen through which the particles will pass has 36 meshes to the inch. For grinding tools like plane bits and knives, a medium-fine grain of about SO is best.' For fast cutting where a highly polished surface is not necessary, a grain of about 30 may be used. The speed with which a wheel runs affects the smoothness of grinding; the faster it runs, the smoother it will grind. 163. Emery Wheels.—Emery, which is a mineral found in nature, was at one time used extensively for making grinding wheels. The particles are tough and tend to become dull more quickly than abrasives made in the electric furnace. Also, emery usually contains some impurities, principally iron. Emery wheels, therefore, tend to glaze more rapidly and cause more heating while grinding. Consequently, emery is not now used in the better grinding wheels. 164. Grinding-wheel Speeds.—Speed is important. A hand-driven grinder should be turned at a moderately fast steady speed, but not fast enough to make the gears "whine" or to cause excessive vibration. A power-driven grinder should be run at a speed that will give the wheels a surface speed of from 4,000 to 5,000 ft. per minute, provided the grinder is ruggedly built, the bearings are tight, and there is no serious vibration. Many of the smaller lightweight grinders will have to be driven considerably slower because of vibration. The surface speed of a wheel may be determined by multiplying the diameter in inches by 3.1416 and by the number of revolutions per minute, aud then dividing by 12. The r.p.m. of different sizes of wheels to give 3,000, 4,000, and 5,000 ft. per minute is given in Table III. 165. Testing and Mounting a New Wheel.—»Sometimes wheels are cracked in shipment. Before mounting a new wheel, therefore, it should be tested for hidden cracks or flaws. This may be done by striking a light blow with a small hammer. If the wheel is sound, it will ring; if there are flaws, it will give a dull thud. The wheel is fastened to the grinder spindle or shaft by a nut that clamps the wheel between two flanges or disks. The nuts should be drawn up only moderately tight, and there should be washers of heavy paper, rubber, or leather between the flanges and the wheel. These precautions should be taken to prevent undue strain on the wheel, which might cause it to crack. 166. Truing and Dressing the Wheel.—The farm shop equipment should include a grinding-wheel dresser. 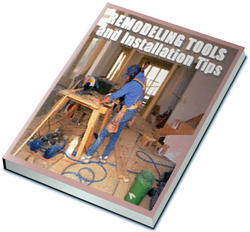 It is an inexpensive tool, and a grinding wheel must be dressed occasionally if it is to continue to give good service. (2) if the pores of the wheel are clogged with dirt, grease, brass, lead, etc. ; and (3) if the grinding surface is grooved or otherwise out of shape. Any of these conditions can be remedied by holding the dressing tool firmly against the wheel while it is turning. If a wheel requires dressing too often it is an indication that it is too soft, too hard, or otherwise unsuitcd to the kind of grinding being done. 167. Safety Precautions. Goggles; Safety Glass Shields.—It is best to wear goggles while grinding. When goggles are not worn, glass shields, made of shatterproof glass and mounted on the grinder, are recommended. In any event it is advisable for the operator to stand slightly to one side so his face will not be in line with the grinding wheel and there will be the least danger from flying sparks, grit, and bits of metal. Wheel guards should be used on high-speed power-driven grinders. They keep most of the particles of grit and steel from flying outward toward the operator, and they also provide a certain measure of protection in case a wheel should break while in use. Adjustment of Work Rests.—The work rest should be set as close to the wheel as possible ^^«RSSSL ™thout touching. This Is very important, against flying particles of grit If the rest is too far from the wheel, the piece and metal. being ground may catch and wedge between the wheel and the rest and possibly chip or break the wheel or spring the grinder spindle. Adjustment of Bearings.—Bearings should be kept tight and well lubricated. Loose bearings not only allow vibration and cause inferior grinding but also introduce an element of danger, especially on high-speed grinders. 168. Oilstones.—An oilstone for sharpening keen-edged tools is practically indispensable in the farm shop. Two kinds of stones are available, natural stones and those made of artificial or electric-furnace abrasives. The artificial abrasive stones are generally preferred as they are more uniform. A combination stone with one side made of coarse or medium abrasive and the other made of fine abrasive is recommended- The coarse side is used for faster cutting during the first part of the sharpening and the fine side for finishing to a keen, smooth edge. Fig. 148.—Ono of the most important safety precaution« in the use of a grinding wheel is to keep the work rest adjusted so that it just clears the wheel. placing it in a pan and heating it in an oven or over a fire, or by washing in gasoline or kerosene. 1. Selcct a good-quality wheel that is suited to the kind of grinding to be done. 2. Well-built, sturdy grinders with good bearings are worth the small additional cost, over cheap grinders. 3. With a hand grinder, turn with a moderately fast, steady speed. 4. Keep the work rest adjusted as close to the wheel a.s possible without rubbing. 5. Hold the tool against- the wheel with a light.to medium pressure. 6. Move the tool from side to ride while grinding io distribute the wear evenly on the wheel and prevent grooving and also to insure even grinding of the tool and to prevent overheating. 7. Keep the bearings well lubricated. 8. Keep the bearings tight. 9. Dress the wheel whenever it- becomes dull (surface glazed), whenever the pores become clogged, or whenever it becomes worn out of shape. 10. It- is best to use goggles when grinding or to have the grinder equipped with safety-glass eye shields. The operator should stand slightly to one; side with his facc out of line with the wheel to lessen the danger from flying sparks, grit, and bits of metal. 11. A wheel may be tested for hidden flaws by striking lightly with a small hammer. A clear ring indicates a sound wheel; a dull thud, a wheel that is cracked. 12. The nut that holds the wheel in place should be drawn up only moderately tight. 13. Use washers of heavy paper or similar material between the mounting flanges and the wheel. 14. A combination oilstone with coarsc or medium grit on one side and fine grit on the other is needed for whetting keen-edged tools. 15. A light oil, such as kerosene and motor oil mixed in equal parts, should be used on an oilstone. 157. What are the advantages and disadvantage« of the grindstone as compared to the newer type grinding wheels? 158. (a) What kinds of grinders are suited to use in the farm shop? (6) What are some important points to consider in the selection of a grinder? 159. Why is it important to understand how grinding wheels are made and bow they grind? 160. (a) What is the general process of making grinding abrasives in the electric furnace? (6) How are wheels made from the abrasive particles? (c) What are the two general kinds of abrasives in common use? 161. (a) What is a dull grinding wheel? (6) How can a grinding wheel be self-sharpening? (c) What determines the rate of shedding of particles from the surface of wheel? (rf) What is meant by a hard or a soft wheel? 162. (a) What is meant by the grain of a grinding wheel? (6) What besides the particle size determines the smoothness with which a wheel will grind? (c) What particle sizes would you recommend for wheels for the farm whop? 163. (a) In what respccts is emery different from abrasives made in the electric furnace? (6) Just why is emery inferior to good electric-furnace abrasives for use in grinding wheels? 164. (a) How fast should a hand tool grinder be turned? (b) State a general rule regarding proper speed for power-driven grinding wheels, (c) What factors must be known before one can calculate the surface speed of a wheel in feet per minute? 165. (a) How may a grinding wheel be tested for hidden cracks or flaws? (b) What precautions should be observed in mounting a new wheel on a grinder? 166. (a) What conditions would indicate that a wheel should be dressed? (b) Just how may a wheel be dressed? 167. (a) How may a workman protect his eyes and face from flying sparks, grit, and bits of metal? (b) Why is it important to have the work rests set close to the wheels? (c) Just how close should they be set? 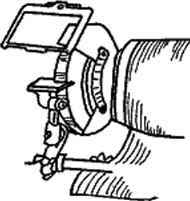 id) What troubles or difficulties are likely to occur from operating grinders with loose bearings? 168. (a) What kind of oilstone is generally recommended for the farm shop? (6) Why should oil always be used on an oilstone? (c) What kind of oil should be used? (d) How may a dirty stone be cleaned? Radebaxtoii: "Repairing Farm Machinery and Equipment." Tuansox- and Kranzubcel: "Metalwork Essentials." Cornell Extension Hull. 378, Grinding Farm Tools. Educational charts and pamphlets, The Carborundum Company, Niagara Falls, N.Y.